Who Will Win The Match Today of DOL vs HL 5th Match CSA T20 Challenge 2019? Today Dolphins and Lions will play their second match of CSA T20 Challenge 2019. 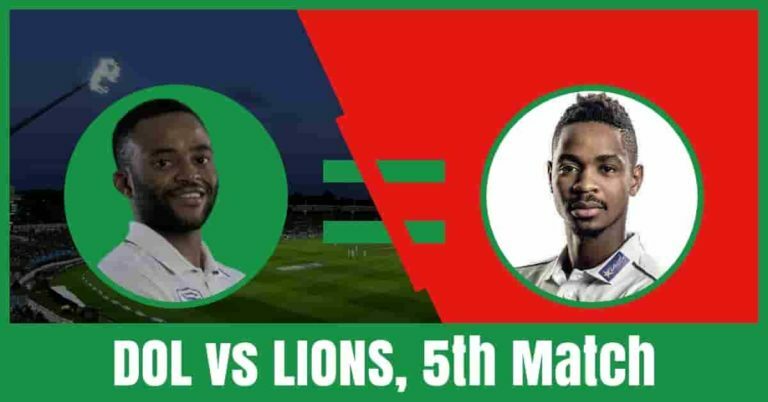 Dolphins are all set to take on Lions on Wednesday, April 10, 2019, at Kingsmead, Durban. Hollywoodbets Dolphins had a good start of CSA T20 Challenge 2019. They have won their first match against Knights by 4 wickets. they are in the second position of the points table with 4 points in their pocket. Marques Ackerman, Sarel Erwee and Morne van Wyk are the top scorers of Dolphins team. They have scored 44, 28 and 17 runs. Prenelan Subrayen and Daryn Dupavillon are the top wicket-takers. they have taken 3 and 2 wickets respectively. On the other hand, Bizhub Highveld Lions had to face last-over loss against COB. Lions are in the 5th position of the points table. They lost against Cape Cobras by 5 wickets. Ryan Rickelton, Temba Bavuma and Wihan Lubbe are the top scorers of Lions. They have scored 69, 46 and 28 runs. Bjorn Fortuin and Wiaan Mulder are the top wicket-takers. They have taken 2-2 wickets each. Eathan Bosch, Sarel Erwee, Morne van Wyk, Marques Ackerman, Sibonelo Makhanya, Khaya Zondo, Prenelan Subrayen and Daryn Dupavillon are the key players of Hollywoodbets Dolphins Team. Khaya Zondo will lead the DOL team. Morne van Wyk, Sarel Erwee and Khaya Zondo will lead the batting department. Sibonelo Makhanya and Eathan Bosch will play as a key all-rounder. Prenelan Subrayen, Keshav Maharaj and Daryn Dupavillon will lead the bowling department. Eathan Bosch and Sarel Erwee are the most valuable players of Dolphins Team. All-Rounders: Eathan Bosch, Sibonelo Makhanya. Bowlers: Lwandiswa Zuma, Prenelan Subrayen, Daryn Dupavillon, Keshav Maharaj. Khaya Zondo (c), Morne van Wyk (wk), Vaughn van Jaarsveld, Daryn Dupavillon, Sarel Erwee, Andile Phehlukwayo, Smangaliso Nhlebela, Cody Chetty, Kerwin Mungroo, Marques Ackerman, Okuhle Cele, Sibonelo Makhanya, Prenelan Subrayen, Keshav Maharaj, Mthokozisi Shezi, Eathan Bosch, Robbie Frylinck, Lwandiswa Zuma, Senuran Muthusamy, Calvin Savage. Ryan Rickelton, Reeza Hendricks, Rassie van der Dussen, Temba Bavuma, Dwaine Pretorius, Bjorn Fortuin and Wiaan Mulder are the key players of Bizhub Highveld Lions Team. Temba Bavuma will lead the HL team. Ryan Rickelton, Reeza Hendricks and Rassie van der Dussen will lead the batting department. Dwaine Pretorius, Wiaan Mulder will play as a key all-rounder. Bjorn Fortuin, Beuran Hendricks and Malusi Siboto lead the bowling department. Dwaine Pretorius and Wiaan Mulder are the most valuable players of Lions Team. All-Rounders: Dwaine Pretorius, Wiaan Mulder, Wihan Lubbe. Bowlers: Beuran Hendricks, Bjorn Fortuin, Malusi Siboto, Nono Pongolo. Temba Bavuma (c), Wihan Lubbe, Migael Pretorius, Dwaine Pretorius, Aaron Phangiso, Beuran Hendricks, Nicky van den Bergh, Reeza Hendricks, Nono Pongolo, Rassie van der Dussen, Ryan Rickelton (wk), Malusi Siboto, Wiaan Mulder, Bjorn Fortuin, Kagiso Rapulana. The pitch Kingsmead, Durban is known for its swing and movement. It is expected that the seam bowlers will get some additional help from the wicket. The batsmen may find it difficult to score runs. The weather of Durban is forecasted to be mostly cloudy and it will remain the same throughout the day. There is no sign of rain today. the temperature is expected to be 23-Degree Celsius and the humidity to be 75%. Lions and Dolphins have played 20 matches against each other. HL has won 10 matches, DOL has won 9 matches and one game was a tie. According to Crix11 Astrology Match Prediction, HL will win today. The team winning the toss should opt to bowl first. according to Crix11 astrology match prediction, Lions will win the toss and opt to bowl first. You may like to read MI vs KXIP Dream11 Prediction. This is it for Today’s DOL vs HL Dream11 Fantasy Cricket Prediction 5th Match. What is your best team? What do you think Who Will Win Today? Leave a reply in the comment section.